Single Line Text fields are the most commonly used field type. They are typically used to insert a small amount (or single line) of text, such as a name or a city. The default value icons can be used to specify whether the text entered in a Single Line Text field on the form builder page should be a default value or a placeholder. Learn how to set a default value and how to set a placeholder in a text field. 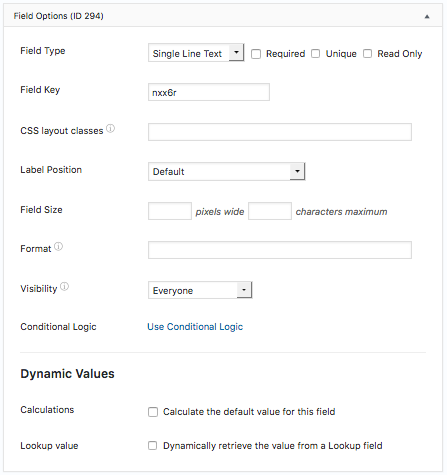 Field action icons allows you to duplicate, delete, and/or move a field on the form builder page. See the field action icons article for more information. Use the Format field option to make sure users provide information in the right format. This can range from phone numbers to postal codes to serial numbers, and much more! 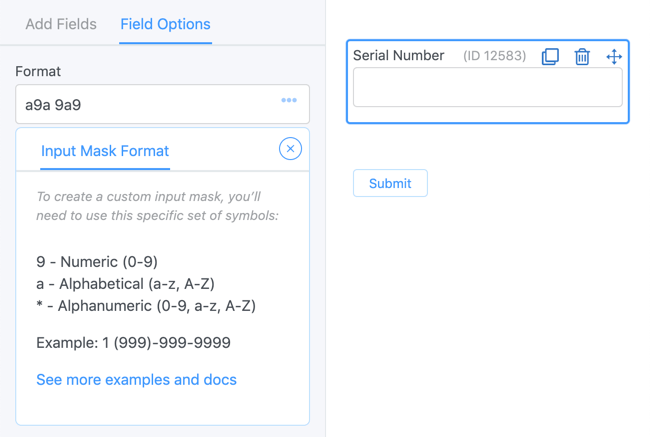 Learn more about customizing the format and input mask for your fields. Display the value submitted in a Single Line Text field in a form's confirmation message, email, or View. Just insert [x], where x is the ID or key of the Single Line Text field. If you haven't created a View before, read more about creating a View.